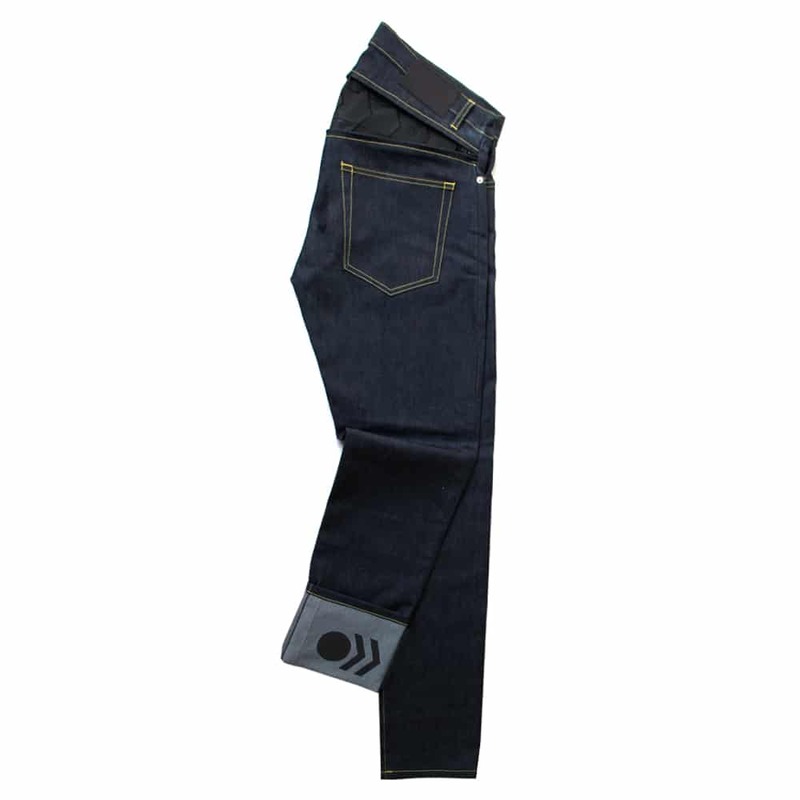 Regular jeans can be some of most unforgiving pieces of clothing when it comes to cycling, they can get warm and sweaty, rarely offer much give (especially if you opt for a slim or straight fit) and can also leave your rearside exposed. That’s not to say you can’t cycling in normal jeans – of course you can. But most certainly aren’t constructed with cycling in mind. Sure, many people cycle in ‘regular’ jeans in cycling Meccas such as Amsterdam and Copenhagen, but they also tend to use more upright city bikes, thus reducing the tension on the material – particularly around the thigh – that you’ll find when riding a road bike or similar. I’ve never particularly enjoyed cycling in jeans. Especially in warmer climes or when entering the summer months. Cycling in warm, sticky trousers is not an overly enjoyable time. That’s where British start-up Resolute Bay have stepped in. 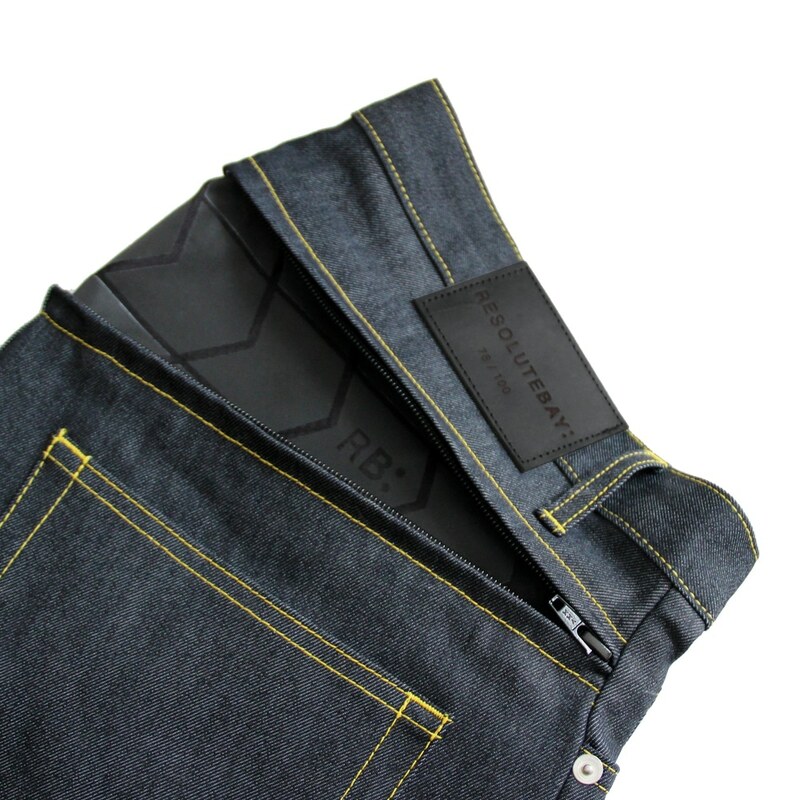 They’ve focused their entire efforts on making a pair of jeans that you can enjoy cycling in. And they’ve done a bloomin’ good job. 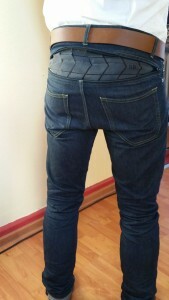 For the past couple of months, I’ve been trying out Resolute Bay’s C1 Cordura Denim cycling jeans. The eye-catching feature on these jeans – as found on all of Resolute Bay’s range – is the “zip-up ripstop reflective back yoke”, which is essentially a hidden section on the back of the jeans (just above your bum), which you can unzip horizontally and expand the rear of the jeans. This does two useful things for cyclists: 1) it allows you to have more coverage on the rear (i.e. no bum crack in sight) and 2) it is a large reflective strip that increases your visibility to motorists. 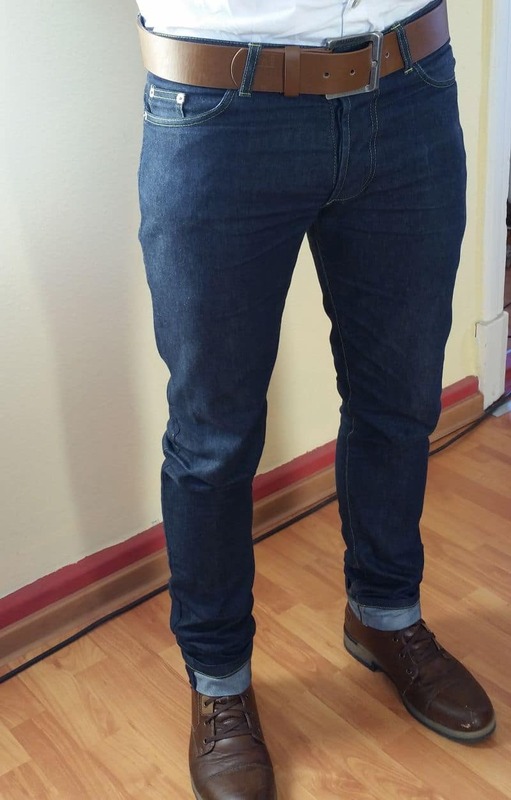 This is a very cool, unique and well-disguised feature of these jeans, but it’s not what I was most impressed with. The best thing about these jeans is the flexibility. You can do squats in them without so much as a hint of strain or fear of a tear. They are lightweight and wonderful to ride in. And, they look fantastic. Better than any of my ‘regular’ jeans that I already own. At £100 too, they are priced reasonably, considering you are getting a premium pair of jeans that are showing no sign of wear or tear despite pretty much relentless use for the last couple of months – coupled with the fact that they offer excellent cycling functionality and I’d you’re getting good value for money. Another feature of the trousers is the reflective turn-up on the lower right trouser leg. While a good idea, the adhesive that had been used to secure the reflective patches doesn’t seem particularly effective, and while they’re still holding on for now, they have already started to peel off and I don’t envisage them sticking much longer. While a tad disappointing, this shouldn’t deter you from what is otherwise an outstanding pair of jeans. NB: Having spoke to Resolute Bay, they have already identified the adhesive problem and will be addressing this in future editions. In terms of specs, they come in a straight fit (a personal favourite) and come with two front and two rear pockets, as well as a coin pocket (does anybody actually use that?). 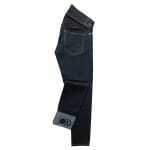 They are made 12oz from Cordura denim (70% cotton/30% nylon) and have a button fly. 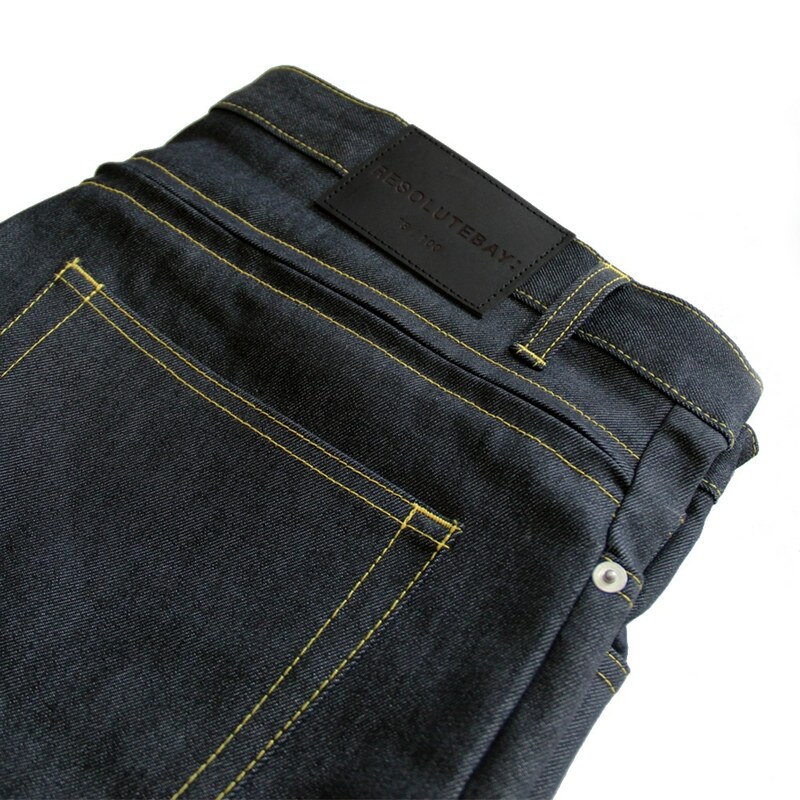 To ensure the sturdiness of the jean for cycling, they also use rivets and bar tacks at key stress points and have reinforced pocket bags, and make use of Heavy Duty Gold Gutterman Thread. The jeans don’t show even a hint of getting rips, tears or wearing out in any area. Overall, I couldn’t recommend these jeans highly enough. A pleasure to wear, regardless of whether you’re on the bike or not. Interesting idea, but what’s missing (at least, I didn’t see it) is a gusset in the crotch. I don’t know if I could ever go back to riding in pants without said gusset — much better than a seam bisecting your legs. Also, the expandable feature is a neat idea, but here’s a better one: simply make pants that sit at the correct height. I wish the trend toward low-rise men’s pants, which sit at or below the hips, would go away. On most men, it’s unflattering, making them look long in the torso and short in the legs — and it’s impractical, necessitating a frequent hiking up of pants, re-tucking of shirts… and innovations such as an expandable section to cover the top of your bum. Anyway, sorry for dropping a rant-bomb on this post. It’s great to see a site like yours. I just wish pants, in general, were cut a bit differently. I owned one. 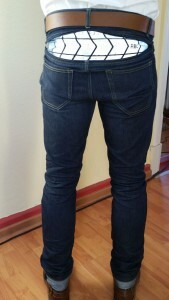 This is a very cool, unique and well-disguised feature of the jean. In addition, it is very comfortable and the reasonable price for this quality. Next story Could Cycling ‘Fashion’ Improve the Perception of Cyclists?